Previously I discussed how a puncture wound could cause a limp but if you cannot find any signs of a puncture, before thinking its a strain or pull – go check their feet. I would say broken toenails or foot issues in general are probably the 2nd most common issue that we as dog walkers commonly deal with. We’ve had dogs injure their toes trying to dig through doorways, playing in the snow and ice or chasing after a ball. The best way to prevent any toe and particularly toenail injuries is to keep your pet’s nails trimmed. I cut all three of my dogs’ nails and my cat’s nails every Wednesday evening (that’s today). Actually I grind them back using a Dremel. I have been doing this since they were just little puppies and a kitten. I still reward frequently and make it as pleasant as an experience as possible. A broken nail is going to cause a limp simply because it is very painful. If you have ever broken a finger nail, or toenail down to the bed – you know what I’m talking about. The exposed tender skin normally covered by the nail on a dog or cat is called the quick. Its packed with nerves and lots of blood supply so they hurt and bleed a lot! Also since your cat or dog walks on all fours, they are more susceptible to infection given the exposure to the ground and bacteria. To avoid further pain, the nail could be broken in such a way that every step hurts! To avoid infection – deep breaks close to the nail bed can harbor bacteria. Have your vet determine the course of action and ALWAYS keep injured exposed quicks clean and covered. There isn’t much worse then exposing a quick to water, dirt and grime found on our sidewalks and yards. If there is just a bit of nail chipped off or little to no quick exposed then simply cut away any pieces that are hanging off. If the blood supply is not exposed and your pet does not have a limp, all will be well just as if you broke your nail without going down to the nail-bed. 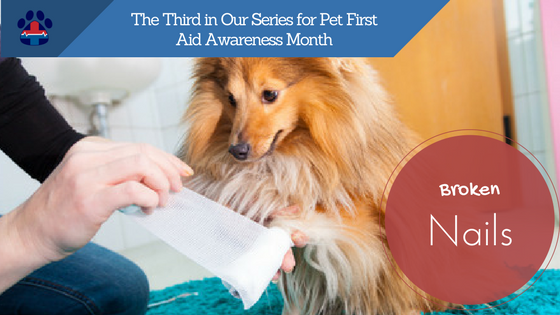 It really shouldn’t matter that it is Pet First Aid Awareness month, we should always be aware of our pet’s gait, their behaviors, their demeanor or attitude. If things change or are off, that’s your sign that something isn’t quite right. A limp can be A LOT of things. Before you go jumping to the conclusion that they tore their ACL (another common problem), first check the feet. Start from the bottom up because if you don’t find a worn pad, cut or broken toenail – you mind find an old wound. Cats and dogs are stoic by nature, they do not want to appear weak in front of us so hiding injuries is common. Take it upon yourself to be aware of what is normal so you can act when they are not. 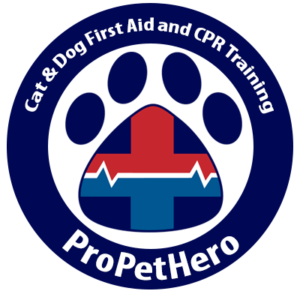 Learn to recognize when pet first aid is needed by starting your training today.